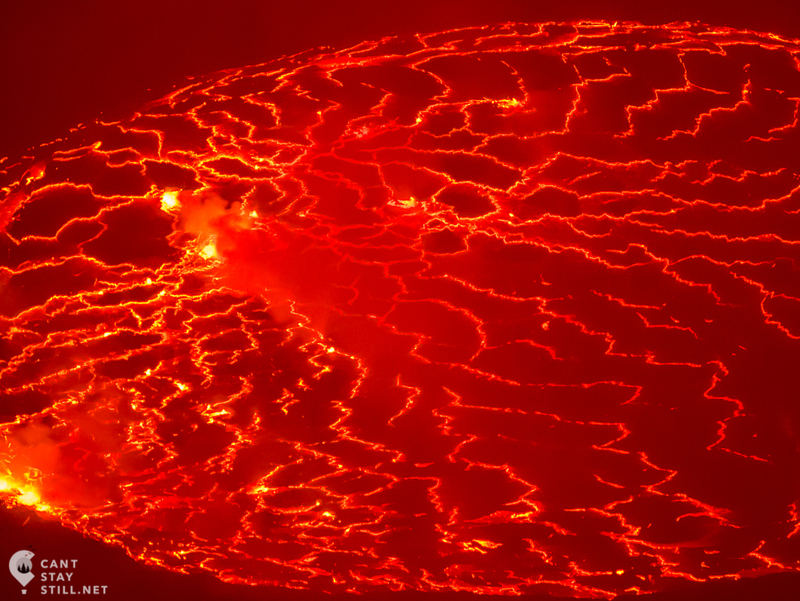 Ever since I visited Ethiopia but skipped Erta Ale, the thought of seeing a lava lake made for itself a permanent home in my head. 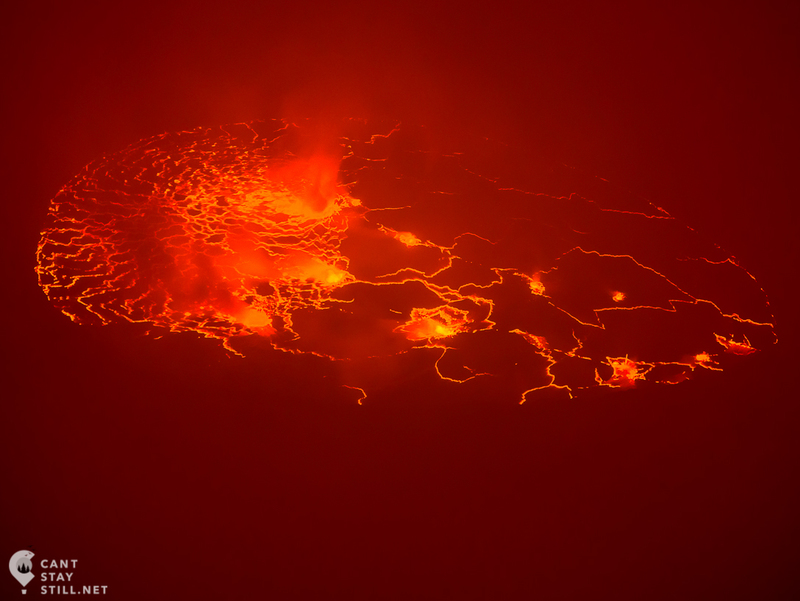 Then I found out that the biggest lava lake in the world is at the top of Nyiragongo volcano, just a few hours walk from the mountain gorillas in D.R. Congo! My memory of what happened next becomes fuzzy and the next thing I know is that I had booked my trip to visit Virunga and the thought of seeing a volcano was having a party in my head with the thought of seeing mountain gorillas. Fast forward to Volcano-day: I woke up at 5-ish out of sheer excitement, as I had set the alarm for 7:00 am. After a short one hour drive through Goma and the adjacent villages, I arrived at the camp, checked in at the office, met the guides (who made sure I had the required equipment), my fellow hikers and we were on our way before I could say “woohooo!”. It was a beautiful cloudy day, t-shirt temperature, and I was more than ready for what was going to be a 4 to 5 hours hike, including 4 breaks. The first stretch of the hike was easier than a walk in the park and we arrived to the first stop on a narrow path through the forest. The second stretch of the hike was just as easy although we started the ascent. At the stops, the guides were sharing cookies that, unlike me, I refused due to a funny feeling in my stomach. We started the third section of the hike and this required more care when walking over the loose lava rocks. Again unlike me, I kept falling behind the group having issues with regulating my effort in what I thought was the effect of the altitude, even though I’ve had no issues before at this elevation. I’m not very sure how difficult or how long this fourth stretch is, but it felt like I was walking for a week when we finally got to the last resting place. From here I could see the destination: the cabins on top of the volcano. It was obvious that what lay ahead of me was the steepest part of the hike, but my mind didn’t process that. I can see the end of it, I can do it. Let’s go! And steep it was but, one step after another, stopping every now and then to catch my breath and take in the stunning surroundings, I made it. Words are failing me to describe the disappointment at the view. 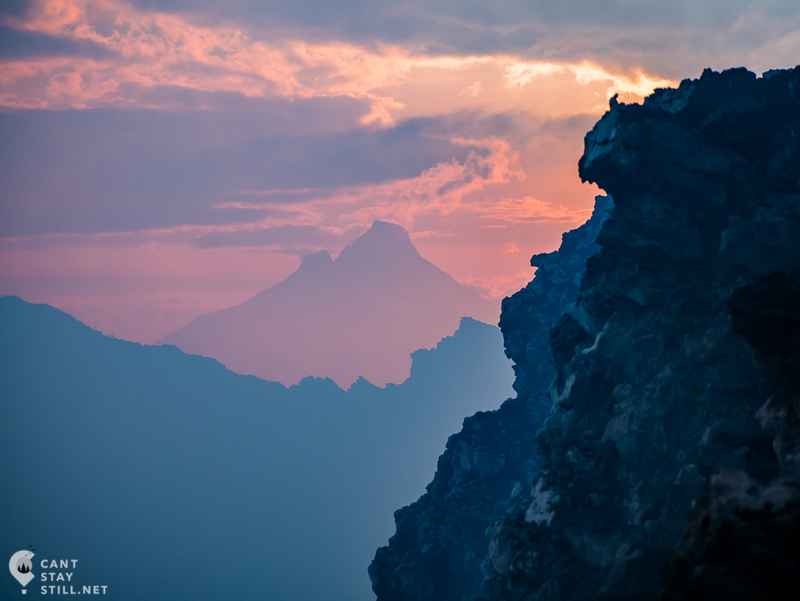 The rain cloud and gases from the volcano decided to laugh in my face and hide the lava lake in a dense mist. Only the jagged rocks and the precipitous drop to the foggy side made it feel like I was on the edge of a crater. Benoit with his usual smile told me not to worry: it will clear out and I will see the lava. So I joined the rest of the group, who thought I’d gave up the climb and turned around. By far the best part of the day yet was spending time around the fire in the “kitchen” cabin. Sharing travel stories, learning about the lives of our Congolese cooks and guides, drying our socks and shoes and counting our blessings made for a great experience together with a group of beautiful people. The night had crept up on us and outside was pitch black, when Benoit called: it cleared up. We got out to a sky lit up by the orange glow rising from the crater. A few steps up the razor-sharp rocks and there it was: a lake of molten rock, the liquid fire moving slowly and the waves breaking against the shore with a constant rumbling sound several hundred feet below us. The soul of the Earth was open in front of my eyes and a small piece of the sun inside was shining through a crack in the hard surface. Bliss is the only word that resembles the feeling. The full display of forces of nature continued through the night with heavy rain, dense fog and wind so strong that made the path to the toilet look like a very bad idea. The next morning we had a wake-up call early enough to see a sunrise that did not disappoint, with Mikeno Volcano showing it’s silhouette for the first time. sitting by the side of Nyiragongo crater and enjoying the view of Mikeno Volcano in the colorful sunrise light. After a freshly cooked breakfast and a last glimpse of the lava through the mist, we headed back on the same route we used the previous day. This time, with clear skies and passable energy levels, I could appreciate the stunning surroundings. 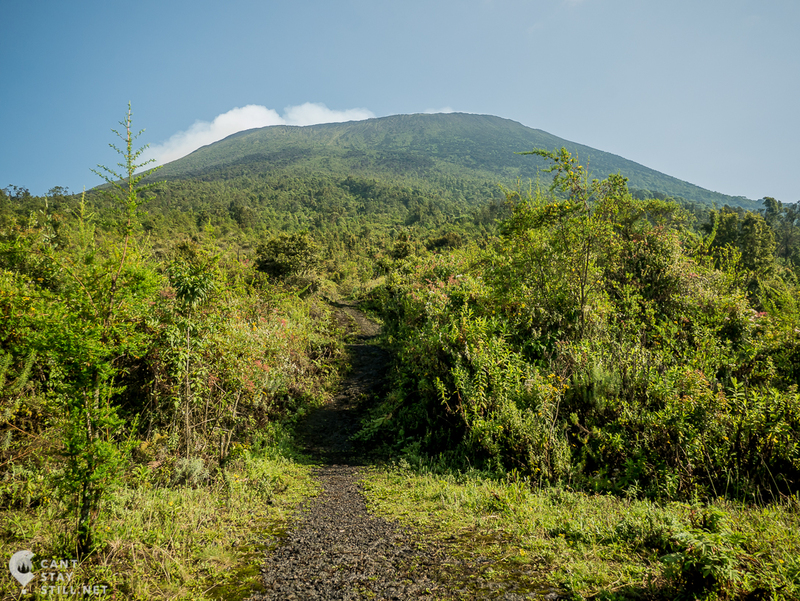 Virunga is covered in Africa’s most biologically dense forest and, as far as my eyes could reach, the landscape was carpeted in green, lush vegetation and dotted with volcanoes. As I was walking the last stretch of the way back, I realized that the thought of seeing a lava lake is still in my head, happy and well, and it’s not going anywhere.